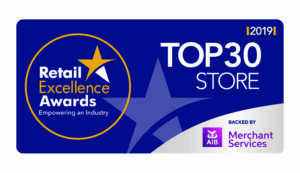 PH Ross Bathroom & Tile Showroom Makes the Retail Excellence Awards Top 30. Competition winner is over the moon! PH Ross Showroom Old Cabra Road, Hanlon’s Corner, Dublin 7. Opening Hours: Monday–Saturday 9.00a.m.–6.00p.m.| Sunday 12.00p.m.–4.00p.m. After hours appointments available on request. © PH Ross 2019. All Rights Reserved.